"The Internationalists" makes a bold argument that the 1928 Kellogg-Briand Pact renouncing war — remembered as a utopian failure — was a stunning success. In August 1928, over a dozen countries gathered in Paris to sign the Peace Pact, also known in the United States as the Kellogg-Briand Pact. The treaty renounced “recourse to war for the solution of international controversies” and “as an instrument of national policy.” By 1934, 63 nations had ratified it, making it at the time the most ratified treaty in history. Of course, within a decade most of the world was at war, including all of the original signatories save Ireland. The book paints a detailed picture of the international order in the centuries leading up to the pact, one in which war was a normal and legitimate tool of statecraft, the primary way states solved disputes and vindicated their rights. Far from lawless, the international system revolved around a set of norms that shaped state behavior, with war the primary punishment for violating the norms. Two features of this system are especially notable. First, wars to conquer territory for a variety of reasons — collecting unpaid debts, punishing treaty violations, securing new colonies, opening new markets — were ordinary, lawful and created a legitimate title to rule the captured territory. Second, states not participating in a war had strict obligations of neutrality, meaning anything resembling economic sanctions or treating belligerents differently was itself a justification for attack by the disadvantaged party. The heroes of the story Hathaway and Shapiro tell are the even-then-obscure attorneys and law professors — Americans such as Salmon Levinson and James Shotwell, and Europeans such as Hersch Lauterpacht and Hans Kelsen — who, after the existing international order culminated in the wreckage of World War I, labored to replace it with a different one. Rather than international law’s focus on regulating war, which still sanctioned it, the “outlawry” movement pressed to declare war a crime under international law, recognizing that, like other forms of crime, it might still exist, but denying it legitimacy and organizing the global community to suppress it. It is a tribute to the movement’s persistence that it eventually convinced political leaders, most importantly the French Foreign Minister Aristide Briand and U.S. Secretary of State Frank Kellogg, to support their efforts, and the 1928 Peace Pact was the result. The fact that the pact was short, vague and did not specify any enforcement mechanisms helped pave the way. States signed on for a variety of motives, many clearly thinking it a largely symbolic endorsement of a noble ideal, and all parties interpreted the pact’s language as still permitting the right to armed self-defense if attacked. For Hathaway and Shapiro, the key to understanding the Peace Pact’s ultimate influence is seeing it as the start of a transformation rather than its conclusion: “Legal revolutions do not end with the passing of a law. They begin with them.” And it’s true the transformation did not look promising at first. Rising powers resented interpretations of the pact that ruled out new conquests but allowed existing colonial powers to maintain control of previously conquered territory (the book’s examination of Japan’s engagement with international law in the 19th and early-20th centuries is especially illuminating). If signing the Peace Pact was the first step, it was developments after World War II that “reaffirmed, consolidated, and institutionalized the transformation that began in 1928.” Its renunciation of wars of aggression was incorporated into the founding documents of the United Nations, it furnished prosecutors at the Nuremberg Trials a new tool for holding leaders accountable for launching such wars, and it helped catalyze the web of intergovernmental institutions and nongovernmental organizations that has dramatically shaped the post-war world. For Hathaway and Shapiro, the key element in this transformation was developing an alternative to war for enforcing international norms, one they call “outcasting.” People often think laws are ineffective without the equivalent of police officers and judges powerful enough to detain and punish those who break them. But Hathaway and Shapiro point to medieval Iceland and other traditional societies to illustrate another approach: expelling lawbreakers from the community’s circle of mutual protection and welfare. Denying the benefits of community membership that people depend upon deters violations of community norms. Hathaway and Shapiro show how a variety of treaty regimes from the World Trade Organization to the Montreal Protocol on ozone-depleting chemicals to organizations regulating coffee, endangered species, and even international mail delivery all rely on economic sanctions and other outcasting strategies to regulate state behavior. In this way, tools once explicitly outlawed under the rules of war as violating neutrality are now the primary alternative to war in international dispute resolution. The best evidence for the transformation sparked by the Peace Pact comes from data on trends in armed conflict. While wars to conquer territory from another state have not disappeared, as the Russian annexation of Crimea demonstrates, they have become extraordinarily rare. As Hathaway and Shapiro detail, the frequency of military conquests and extent of territory involved have both collapsed since World War II. In the century before the Peace Pact, the average state could expect to be the victim of conquest at least once during an ordinary human lifetime; since World War II, the odds have dropped to between once or twice every thousand years. And the conquests that do take place have become far less likely to persist over time as the rest of the international community denies them recognition and legitimacy. Indeed, even conquests from the pact’s signing through World War II were, with few exceptions, defaulted back to their 1928 status at the war’s end; the data show that the year the Peace Pact was signed marks a crucial break in global patterns of military conquest. This decline in wars of conquest is a key driver of one of the most important global developments of the last three-quarters of a century: the stunning infrequency of interstate war compared to the historical norm. It turns out the Peace Pact’s vision of ending wars between states has been remarkably successful. Of course, this success is limited. Even with the decline of interstate war, civil wars within states remain a chronic problem in some parts of the world. And post-World War II “outcasting” tools such as economic sanctions, as well as international institutions such as the World Trade Organization, have their own embedded injustices. Nonetheless, for the particular problem of interstate war, which historically accounted for the vast majority of war deaths, the Peace Pact shows how international norms and institutions do matter in ways that can make the world less violent. 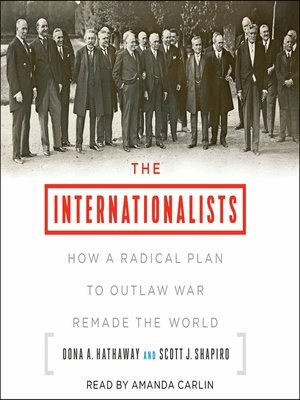 “The Internationalists” compellingly demonstrates how activists can make a difference, and how global cooperation to end war, while difficult, is not a utopian fantasy. Hoover Era Peace Pact during League of Nations era may have foundered over controlling what became Death Merchant Transnational Corporations? i do not remember any time in my life – and i’m 90 years old – when there – were more wars and threats of wars- mostly waged by the U.S. empire- than now. The USA is bombing, starving and blockading Yemen to death, threatening Iran and North Korea and even China. Well, if the current ‘wars’ being perpetrated and perpetuated by the US and its ‘allies’ are not ones of conquest what would you call them? The Peace Pact, along with Article 9 of the Japanese Constitution, and John F Kennedy’s ultimate commitment to “world law,” represent significant steps humanity have taken to stigmatise war making and regularise international dealings. They are a vision of what could be. And if we have also stepped back from them, they still point the way to what’s possible. This article is valuable because it reminds us that their failing to fully succeed might only involve half a step back. But it has also got more complicated. Internal wars have become a new kind of problem which the United Nations was not set up to fix; but we also have “responsibility to protect” which has emerged as an answer to some of these questions. Sadly, we have also had rogue states use “coalitions of the willing” to circumvent the UN. Their short term actions have brought about long time misery. It is a long road to freedom.